The Habiru (Hebrew) clans and their animal totems make a fascinating study. The animal totem of the clan of Hamor, one of David’s “great men,' was the wild donkey. The animal totem of Zibeon's clan was the the hyena and the totem of the clan of Dishan was the gazelle. The totem of Caleb's clan was the dog and the totem of Judah's clan was the lion. The Horite patriarch Jacob refers to his son Judah as a Gur Aryeh גּוּר אַרְיֵה יְהוּדָה, which means "young lion" (Gen. 49:9). The totem of Shobal's clan was also the lion fierce in it youthful strength (young lion). Shobal was one of the Horite chiefs named in the Genesis 36 king list. 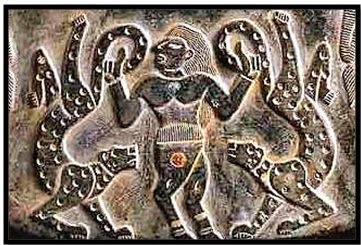 The association of the lion with Judah has antecedents in the Nilotic image of Akar (shown above). The Sun represents the Creator. The Sun rests on the Nile river bed between twin lions facing the two horizons. In Elephantine (Yebu) theology, the sun at noon over the Nile represented the temporal and spatial sacred center. This image of Akar appears on the ancient Egyptian papyrus of Ani (Oni/Ainu) that is in the British Museum. 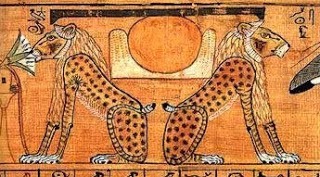 The Sun's cradle between the lions is also the form upon which the ancient horned altars were patterned (shown left). This pattern signified God's sovereignty over the earth, but here the orb of the Sun has disappeared and God's presence is evident as negative space. This suggests apophatic prayer. Apophatic refers to empty space which is filled by God. It means emptying the mind of words and ideas and simply resting in the sacred center. This is sometimes called "centering prayer." When the priest elevates the consecrated host over the chalice, he is presenting an apophatic image. Christ's body is broken in two in order that God might create a place for us in that sacred center. This image is very like the image of the Sun resting between the banks of the life-giving Nile. Likewise, twin lions often indicate the place of entrance. Many arched entrances were flanked by twin lions. They often appeared at the center of lintels or on the sides of gates and arches. The entrance to the Roman basilica in Libya (below) is flanked by lions. This idea extends to the throne of king's and priests. The throne was a door for the passage of Wisdom. Solomon's throne was flanked by two lions, as described in II Chronicles 9:18: "There were six steps to the throne and a footstool in gold attached to the throne, and arms on each side of the seat, and two lions standing beside the arms." Solomon's was one of several seats of wisdom mentioned in the Bible. I Kings 10:18,19 tells of a great ivory throne with two lions standing on the arm rests. This also described the throne of the Coptic Pope. It was common for the back of ancient thrones to have an ivory and gold inlay image of Horus the Golden. Horus continued to be venerated in some Old Coptic texts even into this century. 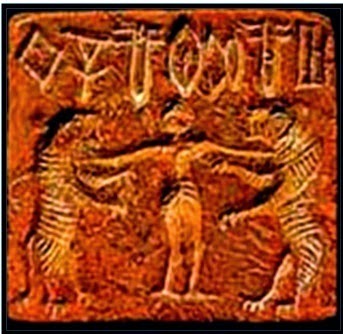 The Horus image appears between two lions in ancient India in the Harappa culture (see below). Har-appa means "Horus is Father" in Dravidian. It also appears in ancient Persia. A variation on this motif is Horus between the two horizons. In the image below Horus is shown as the divine child. The eastern and western horizons are staffs. One is topped by a falcon, Horus' animal totem, and the other is topped with the sema sign (singing papyrus reed), the plant totem of Horus who unites the Upper and Lower Nile. The serpents represent the Nile waters which sustain life for humans and animals. The Egyptians believed that chaos (tehom) dwelt south of Elephantine Island (Yebu) as a great river serpent between the east (bahku) and west (manu) banks of the Nile. In some ancient images, serpents replace lions. 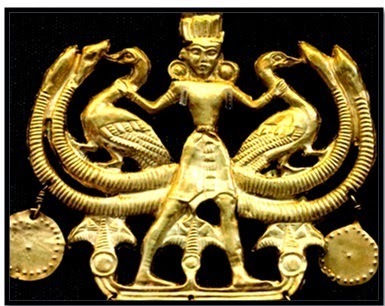 In this artifact from ancient Crete, Horus' mother Hathor appears between serpents and geese. 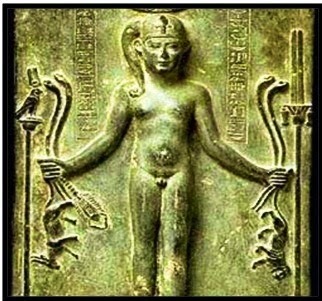 Though Hathor's animal totem was the cow, in later depictions as Isis she was shown with the goose. Isis was called the "egg of the goose" because Geb (Earth) is the father of Isis and his animal totem was the goose. In the Askelon image (below) Hathor is shown between the horizons with the triangular mountain lexeme above her head. The mountain was the place of meeting God. Above the mountain are Hathor's cow horns in which the Sun rests at the sacred center. Askelon tanit shows Hathor between the horizons. The Askelon icon reflects the older images of Hathor whose crown of horns cradles the Sun. This indicates that she was divinely appointed by overshadowing. This is the Proto-Gospel. Luke 1:35: "The angel answered, "The Holy Spirit will come on you, and the power of the Most High will overshadow you. So the holy one to be born will be called the Son of God." The Tanit of Carthage conveys a similar iconic message. This is not an image of a goddess, as some suppose. It is a symbol of the cosmology of Abraham's Nilo-Saharan and Saharo-Nubian ancestors. It designates the temporal center with the sun resting at noon (midway between east and west) and the spatial center with the sun resting on top of a mountain. In Ethiopia the Lion of Judah is associated with Messianic glory and Haile Selassie. The golden Lion of Judah Monument stands in the square in front of the train station in Addis Ababa. It is mounted on a black granite pedestal which is decorated with relief portraits of Emperors Menelik II, Haile Selassie I, Empress Zewditu and RasMakonnen. The statue was erected in 1930 before Emperor Haile Selassie's coronation. Selassie claimed a continuous lineage of from Adam to Solomon, and as Emperor of Ethiopia was regarded by many of his followers as God's rightful ruler on earth. His emergence at a time when Africans were casting off colonial rule was seen as Messianic. He liberated his people. The mark of the true Messiah is to lead his people through death to immortality, something Salassie failed to do, seeing that he never rose from the dead. In 1935, during the Italian occupation of Ethiopia, the Lion of Judah statue was taken to Rome, where it remained for several decades. It was finally returned to Addis Ababa after long negotiations in the 1960's.